Bulgaria provides tourists with an assortment of activities from Sunny Beach to the spectacular Alexander Nevsky Cathedral. Rila Monastery, is picturesque, as are the views from Pamporovo, a popular ski resort. 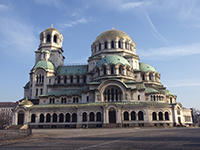 Bulgaria is viably accessible from the United Kingdom by either airplane or substantially longer train and car rides. Travelling from London to Sofia, Bulgaria’s capital, will take around between three and five hours, on average, with stop times reflective of your overall journey time. Driving will see your journey time extend to 26 hours, while transport by train will see this increase further to well over 48 hours and possibly into a third day. If you are unsure as how to manage your medication schedule, you should discuss a plan with your diabetes team. Bulgaria is two hours ahead of British Summer Time and three hours ahead of Greenwich Mean Time, which should not require major adjustments to your diabetes management. However, if you are unsure regarding your medication, it is best to discuss a plan with your diabetes specialist. Bulgaria has a very similar climate to the UK, except summers have a tendency to be slightly warmer and winters marginally colder. Warm weather can lead to enhanced insulin absorption following physical activity so patients on insulin should regularly check blood sugar levels. The currency in Bulgaria is the Bulgarian Lev. Travellers cheques can carry up to eight per cent charges, so may not be best used, while some money exchanges will only advertise the “sell price”. This can look good, but result in a lower rate upon exchanging your money. There are no mandatory vaccinations required to enter Bulgaria, but it is recommended for most travellers to receive vaccination for hepatitis A, which can be contracted through contaminated food and water. Rabies can be found in dogs, bats and other mammals in Bulgaria. This is not a major risk for travellers, but vaccination is advised for people who will be working with or around animals, children, or those planning activities in remote regions that put them at risk of animal bites. Bulgaria is amongst the European countries that allow you to receive state healthcare either at a reduced cost or sometimes for free. It will cover you for medical treatment until you return to the UK. Medication is available in Bulgaria, but payment is required from a pharmacy. Possessing an EHIC card, however, allows you to receive treatment at a lesser cost and this money can be recouped when you get back into the UK. Blood and urine testing kits are available from many pharmacies in Bulgaria, while the emergency services telephone number in Bulgaria is 150. It is advisable to contact the manufacturing company of your medication prior to leaving the UK to find out what is available in Bulgaria if your medication gets lost, stolen or damaged. It is also worth checking to see what different names your medication may be listed as. You should note which syringes are available in Bulgaria, with U-40 syringes the most commonly used. What language is spoken in Bulgaria? Bulgarian is the official language, but English, French, German and Russian are widely spoken. What sugar free drinks are available in Bulgaria? Diet soft drinks with aspartame or saccharin.